FREE Quilt Listings for quilt submissions we choose to accept, display, and offer for sale on The QuiltBroker.com web site. We cannot guarantee that your quilt will sell as a result of being listed on QuiltBroker.com. We reserve the right to NOT list quilts, at our discretion, for any reason. We do not purchase quilts outright; we only list them For Sale, and pay quilters when sold. By submitting your quilt for consideration, as a potential listing For Sale on The QuiltBroker.com, you agree that your quilt will not be listed For Sale, elsewhere on the Web, and that we do not guarantee your quilt will sell, as a result of being listed on QuiltBroker.com. You keep your quilt until it sells and you are free to give it away, or sell it yourself privately (but not elsewhere on the Web). Please let us know, immediately, if your quilt is no longer available for sale so we can remove the listing. One of the keys to selling quilts is to provide good, focused photos of each quilt to be listed. We do not 'help' you price your quilt. You must decide how much you wish to receive. Only quilts that are NOT shown or listed elsewhere on the Internet will be accepted. You can request that your quilt listing be removed via e-mail notice or by phone, at any time, and we reserve the right to refuse or delete your listing at our discretion, and without prior notice. By submitting your quilt listing you agree to hold Design Plus 'harmless' in the event of litigation, for any reason, involving your quilt. If your quilt is used or older, please wash it, following our Quilt Care advice, prior to photographing. DO NOT offer to sell any quilts that are soiled or stained, unless that condition is CEARLY DISCLOSED in the listing Description regarding condition of the quilt. The buyer has the right to know. All quilts are sold 'as is' so if there are any known problems with your quilt, please include that information with your description, so the prospective buyer will be aware. Some buyers like to know if the quilt is coming from a smoke-free or pet-free environment or if your quilt is considered "secondhand". If it is a genuine "antique" please document. Also, please include information about yourself, and the quilt, to the buyer. Upload a high-res digital photo (.jpg or .png) via our submission form together with a detailed quilt description, accurate size in inches (width x length), and the price you want to be paid when the quilt sells (not including shipping). Send ONLY focused photos of quilts that are photographed on a vertical surface. The overall photo MUST include all four sides (edges) and corners of the quilt. We also recommend submitting one additional Quilt Detail photo for your listing. Here are some good Tips for Photographing Your Quilt, and even more Quilt Photography Tips from AQS, but you do not need a rod pocket sewn on the back for your quilt to be submitted for consideration as a possible quilt LISTING for Sale on the QuiltBroker.com. Here's another idea to Temporarily Hang Your (smaller) Quilt to photograph. You could also pin the quilt, across the top, to a large bed sheet and hold or hang that against a wall or over a rod, or pin the quilt directly to the wall, at top corners and across top, using sewing machine needles at a 45º angle. Once your quilt is accepted, we remove the background from your quilt photo and optimize the image for the Web. Your quilt can be photographed vertically or horizontally. For retail pricing, we add appropriate markup to cover our costs and entitled profit, and pay all of your regular shipping costs, in addition to the price you want to be paid. We need to be paid for our time and services, too. Percentage of mark-up varies with size and price of quilt submitted and is at our discretion on a quilt-by-quilt basis. YOU GET PAID THE PRICE YOU ASK, plus reimbursement for shipping, regardless of our percent of profit. You will need a Paypal account, as that is how you will be paid, upon confirmation of sale. You will be paid (your price plus shipping cost) for your 'sold' quilt prior to shipping. You will be expected to adequately package your quilt and promptly send it directly to the buyer via USPS Priority Mail - Insured, UPS - Insured, or FedEX - Insured, with online tracking, as soon as we pay you via Paypal. Your choice of carriers. Do not ship Overnight, Express, or 2nd Day without our permission, or your will not be reimbursed for the extra shipping charges. Also, we ask you not contact the buyer of your quilt, for the purpose of selling additional quilts, in that you have established a 'gallery relationship' with us through prior listings, and because we found the buyer for your quilt. If the buyer contacts you to purchase more quilts, we will expect you to pay Design Plus a commission (30% of selling price) to us for all additional quilts sold to any buyer you found through selling a quilt on the QuiltBroker.com, whether the additional quilts sold were listed on the website or not. Our quilters found selling directly to QuiltBroker.com customers, apart from your quilts listed on this website, or by our permission, will be subject to being immediately removed from our published quilt listings. If you choose to add a label listing fibers, please follow the instructions of the Textile and Wool Acts: see FTC Information page. If your listing description includes the words "secondhand" or if quilt is obviously "used" then your quilt is exempt from the FTC labeling requirement UNLESS you say something about fiber ON YOUR LABEL. 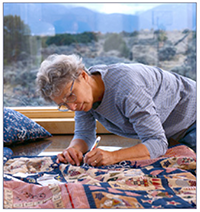 You are responsible for correctly labeling your quilts in compliance with the Federal Trade commission (FTC) basic labeling requirements under the Textile and Wool Acts. If any quilts are 'lost in transit', you will need to file carrier claim to reimburse us, minus your shipping cost, and then we will refund the purchaser. We bear a reasonable risk of returns and refunds, so you don't have to. An exception would be if you misrepresented the information about your quilt and it was returned to us for improper quit labeling, the wrong size, known defects or damage, or other problem that you should have told us about. If you agree to the above, please submit your quilts for consideration as listings, to sell them, on the QuiltBroker.com, and upload your photo (high-res up to 6mb) using our online submission form.